Ahh…January…a time when our thoughts turn to creating positive changes in our lives. Lose weight! Start a budget! Eat healthier! Start exercising! And my personal favorite, get organized! But how do you keep the January fire going all year long? One of the very best ways to do this is to really connect with your reasons for creating change. Why do you want to get organized? How will your life be better when you are more organized? When you connect with these end results, and the benefits you will experience when you are more organized, you will stay motivated for much longer. 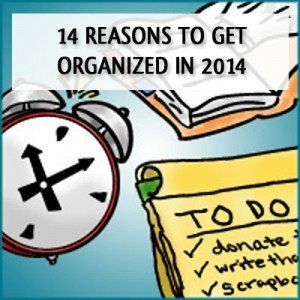 So…here are 14 reasons to get organized in 2014! When you get organized, you’ll save time, and a whole lot of it at that! If you currently spend time looking for misplaced items, or rifling through stacks of paper looking for the electric bill (that was due yesterday!) then you can see firsthand how being disorganized costs you time. Because of this, every step you take in the direction of more order will have a pay off in time saved going forward! Let’s face it, clutter and disorder creates a tremendous amount of stress. It’s stressful to worry about what you’re forgetting to do, or to be unable to do something because you can’t find the things you need to get the job done. As the clutter builds, so does your stress. But the good news is that this works in reverse, too. Every step you take to reign in control over your clutter relieves stress until ultimately you will eliminate clutter-induced stress altogether. Getting organized can also help you save money. If you pay late fees or buy duplicate items because you can’t find the one(s) you already have, then you’ll see a quick payoff by getting more organized. What’s more, being organized can also help you save money if you use your newly honed organizational skills to use coupons or take advantage of other money saving deals. 4. Get unpleasant tasks done more quickly. 5. Have more time to do things you love to do. While getting organized requires an investment of time, you’ll get this time back many times over. This means you’ll have time to do things you enjoy more…like a favorite hobby, or spending time with friends. Being late and being disorganized tend to go hand-in-hand. If you’re rushing to find things like misplaced car keys or a matching pair of shoes, then this can cause you to get a late start on the day. When your home is organized, it’s easier to get ready and be on time to any place you need to be. I know what you’re thinking—won’t being more organized take away my spontaneity? If the organized people you know are overly rigid, then it’s natural to feel this way. But…when you’re organized, you actually have more wiggle room to get things done. This means you can actually be more spontaneous, because things aren’t going to fall apart if you veer off your original plan for a while. For example, if you typically stay caught up with laundry, then you don’t have to worry about delaying laundry for a day and instead join a friend for an afternoon out. You have plenty of clean clothes to choose from the next morning, even if you don’t do laundry today. 8. Love how your home looks. Clutter isn’t pretty. (There’s just no way to sugar coat it!) But, when you declutter and organize your home, you’ll be much happier with how your home looks—even if it isn’t perfect. In time, you may actually fall back in love with your home again. Disorganization can be very isolating. If you’re embarrassed about how your home looks, you may avoid having people over. Likewise, if you feel guilty about your clutter, you may find it hard to go out and do fun things, because you feel you should be home organizing. By getting more organized, you’ll be free to socialize more. When friends drop by unexpectedly, you’ll be happy to welcome them in, and when you get invitations to go out, you’ll feel able to accept the invite guilt-free. Clutter drains our energy. If you don’t believe me, walk into the most cluttered room in your home and simply take note of how you feel. Is it harder to breath? Do you feel stressed or anxious? Then, think about the last time you decluttered and organized. Remember that energized feeling? 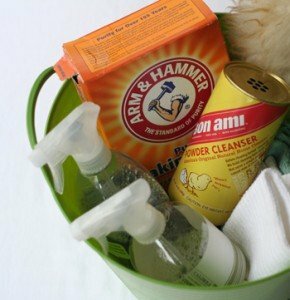 When you clear the clutter your home will energize you, which means you will have more energy and feel better. When you’re organized is it’s easier to make healthy choices. You’ll have more time to exercise and plan (and cook) healthy meals. This can mean fewer last minute trips through the drive through, or calls for carry out, because there’s no time, energy or food to eat in! Clutter is also very distracting. Your piles taunt you with unfinished tasks, and worries over what isn’t getting done. When the clutter is gone, you’ll find it easier to stay focused on the important tasks and people in your life. Clutter erodes our confidence. You may worry that someone will make their way into that “one room” or find out that you don’t really have it all together the way people think you do. When you get more organized, you’ll alleviate those fears. You’ll gain confidence and feel great about your home and most of all yourself. 14. Be a positive influence on those around you. Sometimes it’s harder to find the motivation to do something for ourselves, and easier to do it for someone else. So if none these other ideas are compelling to you, then consider if it’s more compelling to get organized for others. Your efforts and the new skills you learn by getting organized can help others. You’ll be more positive. You’ll be a good role model. And, if your clutter is currently bothering your spouse or someone else you live with, that stress and strain will be removed from your relationship. So there you have it, 14 reasons to get organized this year. Pick the ideas that connect most with you and why you crave more order in your home and life. Then, write them down and put them some place where you can see them anytime you need an extra dose of motivation to keep moving forward. What are your reasons for getting organized? Are they one of the reasons I’ve listed above, or do you have other reasons of your own? Share your reasons in the comments! I look forward to hearing from you! Your reasoning is spot on, Aby! As a creative, imaginative person, I fought routines for years, decades, as being restrictive and confining. I see, too, that the biggest factor in my struggle to *stay* organized is that I’ve not established new habits and routines to sustain my new systems and plans. So now I am working to establish them, because I finally get it! Thanks for your comment Linda! Glad you are embracing routines now.